Registration for 2019 Youth & Pre-teen classes will open on January 7 at 10 am! Click HERE to see available classes and tuition cost. Discounts offered: 5% discount for season tuition payment in full by first class date. Sibling discount offered for families with more than one student enrolled in any program: 15% off tuition (of equal or lesser value) for the 2nd and subsequent siblings. Not applicable to costume fees. Discounts cannot be combined and are not applicable to Pre-teen mini-classes. Tuition may be paid in full or in equal monthly payments, due each month on the 10th. Performance and Beginning team members have a costume fee due by February 10th. Monthly payments have been calculated based on the full cost of the entire season being divided into equal installments (so although some months may have more or less classes/rehearsals, tuition amount has been averaged to remain the same). Tuition & fees are non-refundable and no credits or refunds will be given for missed classes/rehearsals. A 10-day grace period will apply to all due dates, after which any payment not made will be considered late and a $10 late fee will apply, and will be re-applied every 30 days that the balance remains unpaid. Written notice of withdrawal from classes/teams must be given one month in advance, and tuition costs will apply for that month (regardless of what date actual attendance stopped). You can make payments with a credit card online for no additional fee, or pay in person with cash or check. Auto-pay option is available online! No food or drink (except water in a closable container) is allowed in the dance room. Food items may be kept and eaten in the hallway. The dining hall and kitchen is strictly off-limits to all students and parents; no practicing, eating, or entrance of any kind is allowed. Please do not attend classes or rehearsals when you are ill. We are in close contact with each other and illnesses can spread easily if someone attends when contagious! Thank you so much. Outside of class times, no supervision will be provided for minors. Especially for our pre-teen classes, please be prompt in picking up your students. Olympic Ballroom Dance LLC has ZERO tolerance for bullying or harassment of ANY kind. This includes any behavior that demeans or puts down our fellow class or team members, such as gossiping, intimidating, excluding, or patronizing other team members. This also includes the use of phone apps that promote this behavior. Corrective action may include dismissal or expulsion from classes or teams. Performance and Beginning teams have specific dress codes; please reference your team contract for details. For classes, please wear comfortable clothing that will allow for movement. Ladies can wear leggings, dance/exercise pants, or dance skirts (with shorts or leggings worn underneath), and please choose tops with a higher neckline that will not shift down or open with movement. Gentlemen can wear dance/exercise pants or other pants made with material that has some stretch. FOR MALES & FEMALES: PLEASE NO JEANS, SHORTS, OR TANK TOPS. 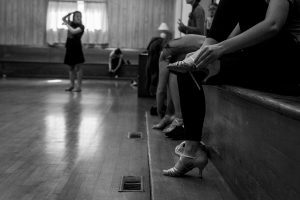 Appropriate ballroom shoes are required for all programs except the Intro to Ballroom classes, although still highly suggested for proper movement and learning. Shoes MUST have a non-marking sole. Many sneakers and tennis shoes leave big streaks on our floor, so please check them before wearing! Please keep wet and/or dirty shoes off the dance floor. If you do not yet own a pair of dance shoes, we ask that you bring a pair of clean, studio-only shoes that you can change into inside. Sneakers and athletic shoes with a rubber sole are not ideal since they stick to the floor when you move, which will prevent proper technique and can be a safety hazard. Do NOT wear heels that are not specifically designed for ballroom and/or Latin dancing. 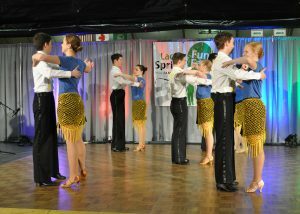 Dancing in socks or bare feet will not be allowed (other than warm-up). NO SANDALS OR STILETTO HEELS.